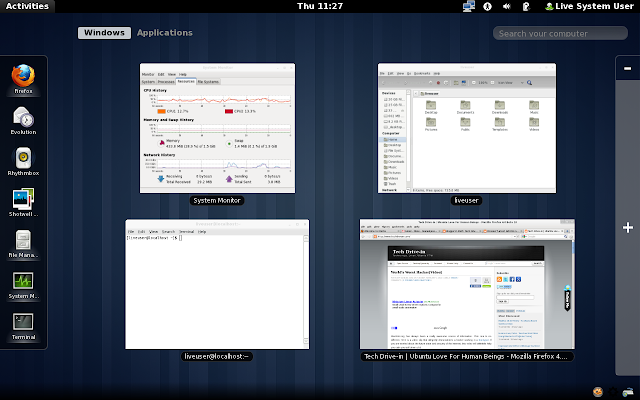 GNOME is among the most widely used Linux desktop environments out there, if not *the* most widely used one. GNOME Shell is the latest incarnation of GNOME which is still undergoing heavy development. Months ago, we captured the evolution of GNOME Shell in detail and I think its time for another major GNOME Shell review. Last time when we reviewed GNOME Shell from Ubuntu, downloading and installing GNOME Shell was the easiest part because of the ricotz testing ppa which we have discussed before. But everything has changed in the last few months. Ricotz ppa is not updated anymore and if you want to download and install the latest GNOME Shell in Ubuntu, you need to build GNOME Shell from GIT. This is no easy thing to do. WebUpd8 has a incredible(and constantly updated) article describing how to do it if you are interested, but I chose to go with the GNOME Shell Live CD method instead. There are now live CD versions of Gnome Shell available for Fedora and openSUSE. So in order to test GNOME Shell, you need not install it. 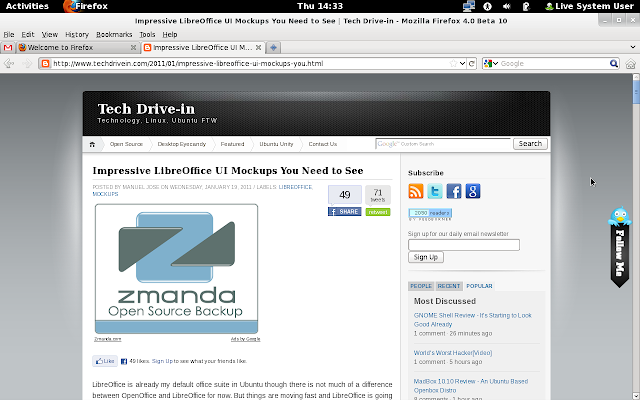 Instead, you simply have to write the GNOME Shell ISO files onto an USB drive or CD. Here are the download links for GNOME Shell Live CD builds of Fedora and openSUSE respectively. I installed latest GNOME Shell (Fedora version) in my USB drive using UNetBootin. I am writing this review directly from latest GNOME Shell build(default browser is Firefox 4 Beta 10). One of the first thing I noticed after booting into the latest GNOME Shell was the new incredibly beautiful default wallpaper. 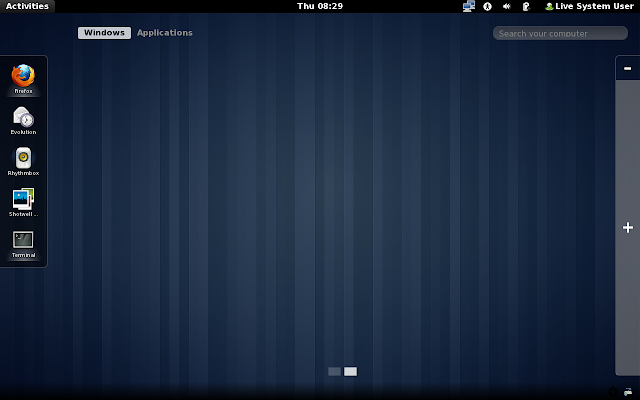 This blue wallpaper with vertical stripes integrates so neatly with the overall darkish theme of this next generation GNOME desktop. One another thing that came to my notice was that, I was not able to type anything using my keyboard while inside GNOME Shell desktop, though it was working fine while using applications like Firefox. I was not able to use the default desktop search functionality or even the ALT+F2 shortcut because of that. Strange thing was that, ALT+F2 key binding (run application functionality) would work, but I was not able to type anything in it. And I am still not able to figure out why it happened. A lot has changed with GNOME Shell since we last reviwed it some months ago. ALT+F1 key binding works as you expect it to, but the dock menu on the left hand side has got a lot slimmer now(clearly inspired from Ubuntu Unity's dock I would say). Listing of applications is very neat and without any clutter. There is also an "add/remove workspace" button on the right hand side which will appear only on mouseover. If you have applications running already, ALT+F1 will help you to easily navigate between the applications you are currently running and the new applications you might want to start later on. You can access the same functionality by moving your cursor towards the top left corner or by simply clicking on the Activities button on top. It all works very fine and the new refurbished GNOME interface is quite intutive too in my opinion. The "add/remove workspace" option in the new GNOME Shell interface is a lot better than the 2/4 workspaces which the previous GNOME interface had as default. Things are a lot more clearer and easier for a newbie GNOME user now I think. Unlike last time, docking applications into the default dock has become simpler now. 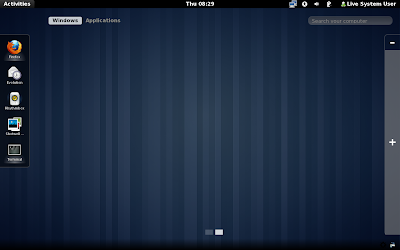 Simply right click on the application inside dock and select "add to favorites". There is also a "new window" option which helps you launch the same application twice like when you are in a different workspace for example. And there is no global menu integration yet in GNOME Shell as we had seen before in the latest Ubuntu Natty's Unity interface. Only thing that really bothered me was the lack of ability to navigate through desktop solely using keyboard. For example, once you activate the side dock bar functionality using ALT+F1 key binding, there is nothing else you could do using keyboard shortcuts. Also, while writing this article, GNOME Shell crashed without any provocation nearly 3 times. But then what else do you expect from this very early release of GNOME Shell anyway. GNOME Shell is not anywhere near its final release and things have already started to look really good. 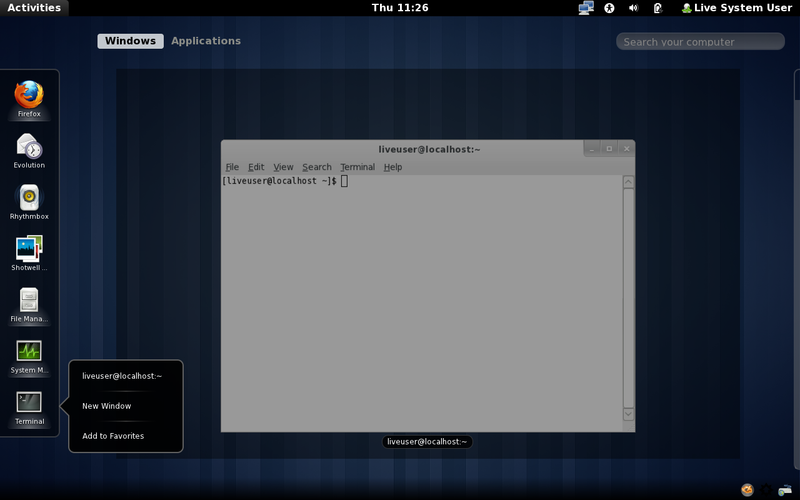 GNOME Shell's new Mutter window manager works very stable and slick. 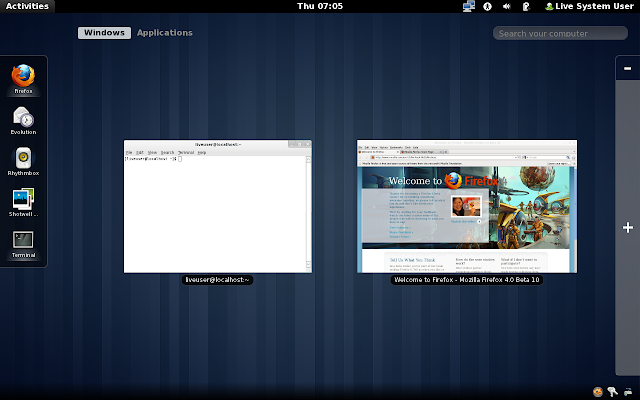 Though in the slickness department, I would still rate Compiz based Ubuntu Unity over Mutter based GNOME Shell anyday. 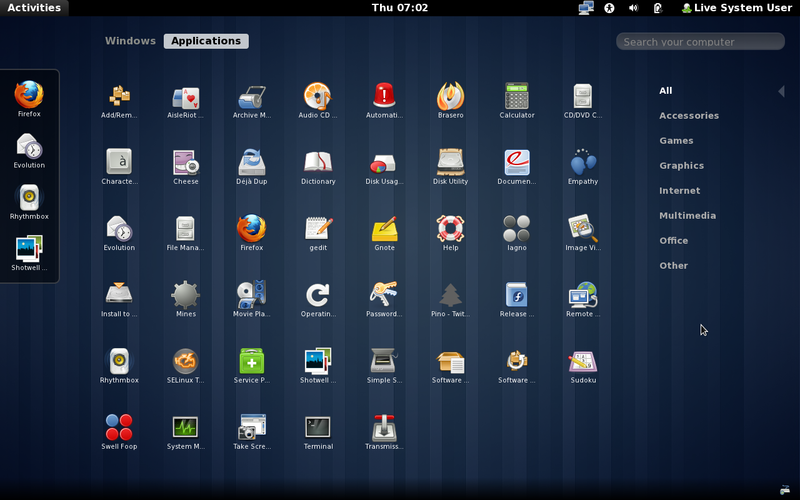 From the initial looks of it, I am pretty sure that GNOME Shell is going to give Ubuntu Unity a real run for its money. But to be frank, I don't care who wins the battle. Ultimate winner is going to be us, the GNOME users/fans, who will now have two awesome intefaces to choose from. Watch this space for all future updates.